Over the weekend, my husband and I decided to have a few people over to watch basketball, play cards, and hang out. Adult beverages were consumed in a responsible manner, for most of us at least. 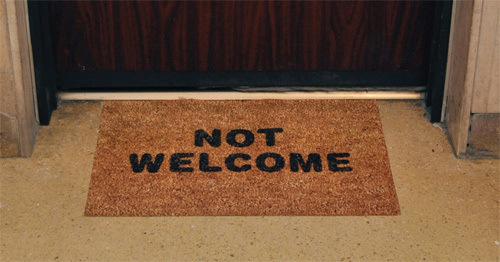 After a few events that occurred that evening, I decided to dedicate a post strictly on the things you shouldn’t do while visiting someone’s house and the easiest way not to be invited back. 1. If you stay the night, fold the blankets up that you used. It’s polite and it shows the owners of the house you are thankful for their hospitality. 2. If you drink too much and feel like you’re going to get sick, make sure you head to a toilet. Don’t throw up on the house owner’s couch, floor, or curtains. Or even in the sink while the house owner is doing dishes. 3. If you get sick while at someone’s home, call or text the next morning and ask if there’s anything you can do to help clean up, or get the stench out of their couch cushions. 4. Girls get emotional, boys don’t. If you start crying about how much you love everyone, you probably won’t get an invitation to the next party. Perhaps you should stop drinking. Immediately. 5. If you fall asleep while sitting up and with your shoes still on, a few things could possibly happen. You might get drawn on, you might get turned into a photo prop, and you probably won’t get invited back. 6. First and foremost, I’m a mom. If you’re out of control and being crazy, you’re not invited back. It’s one thing to have a beer or two and hangout with friends, but it’s another thing to act a damn fool and need me to babysit you too. 7. Not saying “thank you”. It’s just downright rude. I may have been guilty of one or two of these things at some point in my life, but I have taken full responsibility for it. I don’t drink much or often anymore because caring for my child is more important. Obviously too much alcohol inhibits the ability to care for him and I never want to put myself or him in that situation. For me, it’s a choice I made after becoming a mother and I know not everyone feels the same way or needs to, because they aren’t a parent. However, I think it’s disrespectful to come into someone’s home, think it’s a free for all, or try to get as drunk as you possibly can. That’s not what “get togethers” are about. If I wanted that type of atmosphere, I’d time travel back to college but fortunately for everyone, I’ve gotten that out of my system (and it’s physically impossible). People make mistakes and I get that, but respecting someone’s rules and their home shouldn’t need to be compromised in order to have a good time. What drives you insane about house guests? !